Right in the Heart of the American Midwest is the place known as the water park capital of the world, and the place that started it all, the Polynesian Hotel Wisconsin Dells. So, somewhere in Wisconsin, you can escape to the tropical islands; the Polynesia of Wisconsin Dells. It’ is your ticket to a themed, indoor and outdoor waterpark that hosts over 300 guest rooms and complimentary entrance into the waterparks with your room rental. It is a smaller more contained water park making it ideal for all ages and families. Although Wisconsin has always been known as a place for water sports in the warm summer months, the water park mania really took off in 1994 when the Dells Polynesian hotel and Resort decided to try and draw in business during the off season by winterizing part of their water park. The result was explosive and people began to flock to the resort in droves to play water basketball and enjoy summer fun when the snow was thick and the wind-chill factor made the thought of going outside only suitable for polar bears and penguins. The waterpark at the Polynesian Hotel Wisconsin Dells is neither the smallest nor the largest in the area, but is considered to be one of the best family value deals in the area as kids under 10 stay at the resort for free-what a deal! There are numerous floor plans and types of rooms available, with a near by fitness center, and arcades right within the resort. There are some restaurants for kids as well as fine dining for the whole family. The indoor and outdoor water parks of the Polynesian are in fact, a part of the resort and are not open to the general public like some of the other area water parks are. So if you want to play then you have to stay as an overnight guest. But with 200,000 sq. ft. and more than 500,000 gallons of water both indoors and outdoors, why go anywhere else to play? 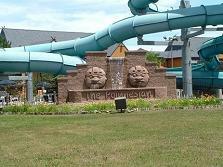 The indoor water park of the Polynesian Hotel Wisconsin Dells offers up a 38,000 sq. ft. of rip roaring, wet and wild fun for children of all ages. And with a total of 6 indoor water slides, there are thrills and excitement for everyone even in the deep dark heart of winter. With not one but two incredible 2 story high water slides; one tube slide and one body slide, get ready for twists and turns before getting deposited into the cool peace of the lagoon. The play area of the Temple of the Black Pearl cannot be missed by water slide enthusiasts of all ages. For those who like their water sports more relaxed, there is the Indoor Lazy River. The Lazy River drifts through Blackbeard's Dark Tunnel Mystery Voyage, a voyage that includes several delightful animated characters and features water tunnels and ends with a drenching from a waterfall for added excitement. The Water Factory is a more of a kiddy city and the place to be for the little ones and those who prefer a less thrilling time. With 80 interactive water games suitable for the smaller guests including several kids slides for the faint of heart and those who are too small for the big slides, and two whirlpool tubs including a kids spa for those who want to really relax, the Water Factory is great. For adults and those who love basketball and volleyball, make sure you check out the Aloha Pavilion. The Pavilion features a water volleyball and basketball area where fun and games is all that matters. Our boys quickly found themselves playing their own version of March Madness with few other guests! The Kiki “kids” Paradise play area features a Froggy slide for the bigger little kids, and for mom and dad, there is nothing like a relaxing whirlpool and sauna. Perfect area for the young ones as it is closely supervised by lifeguards. With over 200,000 sq. ft. of outdoor play area, the summer season at the Polynesian is a wild and adventurous blast of adrenalin and thrills. There are not one or two but three huge 3 story tall water slides that will amaze and delight those with a need for speed, nerves of steel, and the willingness to become absolutely soaked. The outdoor water park is open from Memorial Day to Labor Day. The outdoor Lazy River will calm your jangled nerves after the adrenalin rush of the big slides, and the kids will adore the soft slides, soft side submarine and interactive outdoor kiddie areas including the Creature Adventure Walk. Not all waterparks have an indoor and outdoor lazy river. For even more thrills and chills, the interactive Buccaneer Pirate Ship is 40 feet long and promises plenty of adventure. Kids of all ages love pirate ships, especially an interactive one! Sports fans will love to play a rousing game of underwater basketball and water volley ball. And for the adults, the Polynesian TiKi Bar promises those wonderful drinks with the little umbrellas in them to fortify your nerves. They also have music playing outdoors which adds to the overall ambience, and towels are readily available! The rooms offer a small refrigerator, microwave, coffee maker, ironing board, hair dryer, safe and satellite television. If you can … arrive early … and stay late. Check in time is 4:00 pm and check out is11:00 a.m. After you vacate the room, you may stay and use the water park facilities all day. There have lockers and showers in the Temple of the Black Pearl. 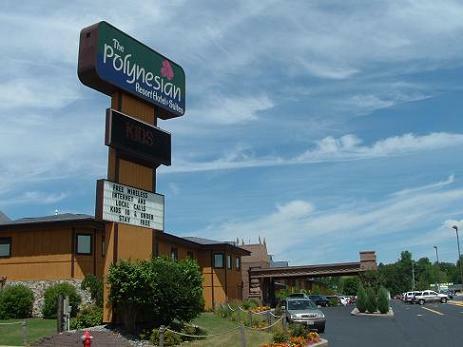 All in all, a trip to the Polynesian Hotel Wisconsin Dells is well worth the money for an exciting and relaxing vacation. There is certainly a wide range of slides and pools, and definitely something for everyone to enjoy. Like we said earlier, it is neither the smallest nor largest water park, but one thing is for certain, it is one of the most affordable in the Dells.